Whisk together vanilla pudding mix and eggnog, using eggnog to replace the milk. Add pumpkin pie spice and beat for 2 minutes. Chill in refrigerator for 10 minutes. In a large glass bowl, layer with 1/3 gingerbread cookies, 1/3 pudding, 1/3 whipped topping, and 1/2 apple butter; repeat. 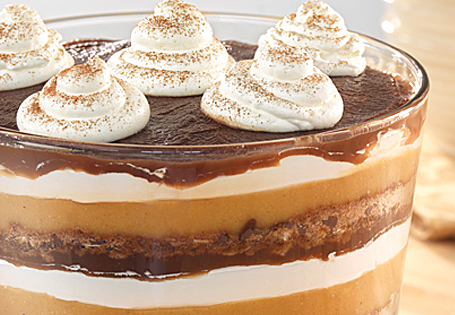 The third layer will end with the whipped topping. Garnish with cinnamon. Place in refrigerator to chill for 2 hours.